Part of the pile of stuff we're shipping to Macau! ﻿ Today was so productive! I've been slowing down, losing speed, getting frustrated, and despairing of ever finishing the enormous task ahead of me. Two things changed that today. First, I went and leased a 10 x 10 foot storage unit. Second, my dear friend Cassi (who should have been my sister if life were fair) came over to help me whip things into shape. The Storage Unit: I budgeted $100 a month on storage, and I shopped around our town at numerous places, getting tours and looking at dozens of metal rooms to hold our stuff. I ended up going with a place that is walking distance to our current home. Not really a benefit when we're halfway around the world, but great for getting stuff from here to there! For $100, the biggest place I could get was 10 x 10 feet. I know in other areas of the country, that's a horrible price. But this is Los Angeles and it's pretty standard. Walking around in it really helps me visualize how much I've still got to get rid of! We know we'll be gone at least two years, and our best guess is that we won't be back for three to five. So taking that into consideration, it is far more wise for us to sell off 95% of our furniture, and save a little bit of money each month to buy new stuff rather than spend hundreds of dollars each month to store it. We will store the master bedroom furniture, as it is my dream set that my husband purchased on layaway ten years ago. The rest of our house is furnished by IKEA, but our bedroom is exactly what I'd want if I could have designed it myself. We will store my Great-Grandmother's cedar hope chest, which contains keepsakes such as my wedding veil, the outfits we brought our babies home from the hospital in, and some family linens from my Mom's side of the family. And we'll store our new dining room table that seats 14. I saved up for two years to buy it, and they don't make that length in that style and color anymore. And it breaks down into storable pieces so it's worth it to me. The only other piece of furniture we're saving are the bunk beds that my Dad made for the boys, but we're shipping them to Macau so they won't be in storage. Other than those things, everything goes. 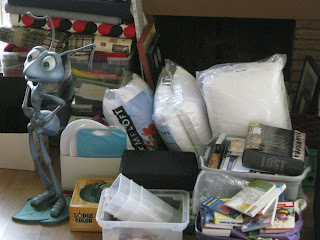 And knowing how much space they take up really helps me to purge, purge, purge the rest of our stuff! It's like I've got a fire under my feet and new motivation. Better to get rid of stuff now than to come down to the wire and have our storage space filled to the rafters and have to open up packed boxes to get rid of more stuff on the spot! My Friend Cassi: With every single move we've done, I always start off fast and furious, skimming off all the easy stuff. I make a huge dent. And then I start getting to the end and I find that I'm just moving stuff around from one spot to another rather than making any progress. On this move, I decided to rotate what room I work in on a daily basis. This is great because I never get bored of spending too much time in one place. But at this point in the process it's not so great, because I don't have a single room that I can close the door to and call done. Normally I would call my trusty Mom to swoop in and save the day on all those final things that give me grief because she's really, really good at that. But surprise, surprise! After three years on the market, my parents just sold their house last weekend! They'll be leaving California on July 30th, just 20 days after we leave the country! So you could say that my Mom is a little busy right now! Enter my friend Cassi. She is an organized neat freak and the exact opposite of me when it comes to housekeeping. Which is to say that she keeps a very organized and neat house. My house is... lived in. She marched in today, and together we finished an entire room (Hooray! One room totally finished!) and made such significant progress on the garage that I sure wish I'd taken before and after photos. The garage is sectioned off with one side full of packed and labelled boxes ready for storage, and the other side full of boxes jammed full of garage sale/Craig's List goodies. Cassi rearranged everything so it's no longer the maze of death and leaning towers of doom that I managed to create. She did it all so effortlessly that it looked like a magic trick. I was amazed and so grateful. We should all be so lucky to have friends/family members/spouses whose strengths perfectly match our weaknesses! Thanks to Cassi, I've got my groove back. Life is good again. I'm back to work, with a merry tune in my heart and renewed energy and enthusiasm! I found some glow sticks in a box in the garage, and my kids were begging me to have an early bedtime so they could use them tonight. Who am I to say no to that request? Goodnight, children! Hello, alone time for Mama get more work done! Twenty-two days until Michael returns for us. Thirty-two days until we're on that plane, starting a new life in Macau! Totally doable! Knowing what a rough week last week was for you, this post makes me so happy and hopeful! Thank you dear Cassi for your help! Its amazing and lifts my spirits knowing what an impact you made in Heather's day/week/month! thank you!